NAB in Las Vegas saw the unveiling of Panasonic's HPX-170 P2 solid-state camera. The 1080p camcorder has the widest zoom lens in its class, a 13x Leica Dicomar with 28mm wide-angle setting, and an SDI interface, all in a 4.2-pound body. Full press release of the HPX-170 P2 after the jump. LAS VEGAS, NV (April 13, 2008 ) - Panasonic unveiled here at NAB the AG-HPX170, a fully solid-state P2 HD handheld camcorder. 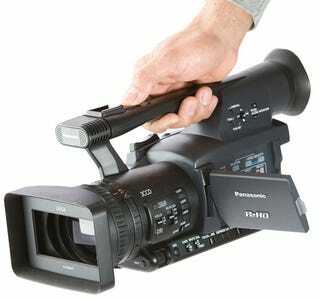 A full production quality tool, the solid-state handheld camcorder enables high definition and standard definition recording, the widest zoom lens in its class, and a HD-SDI interface for connection to baseband production and distribution infrastructure, all in a lightweight 4.2-pound body. Fully solid-state, the two-slot HPX170 is a 1080p capable camcorder that offers the compelling advantages of P2 technology including: no moving parts unlike tape, hard disk drive, or disc-based systems; instant random access to recorded HD or SD content; a faster IT compatible file-based workflow; and the ability to operate in harsh environments with resistance to temperature extremes, shock and vibration. Building on the success of the AG-HVX200, the HPX170 is equipped with new advanced 1/3-inch 16:9 3-CCDs and a high-performance digital signal processor with 14-bit A/D conversion and 19-bit processing to deliver broadcast-quality, independent frame recordings. The HPX170 offers a 13X Leica Dicomar zoom lens with a 28mm wide-angle setting (the widest in its class) and a cam-driven manual zoom for smooth, easy and precise operation. For added flexibility, the camera provides auto or manual focus and iris. The multi-format camera records in 20 HD and SD formats; in a variety of 1080i and 720p formats in DVCPRO HD, in 480i in DVCPRO50 and DVCPRO, and in 480i in DV. It's switchable between 16:9/4:3 aspect ratios. The HPX170 offers a 20-step frame rate selection in 720p mode for variable-speed shooting in the 12fps to 60fps range to acquire fast- or slow-motion in-camera effects. For added creative flexibility, professionals can select from a variety of advanced gamma functions and settings including a CineGammaTM mode. With its two P2 card slots, users can record up to 64 continuous minutes of the highest quality DVCPRO HD recording using currently available 32GB P2 cards. Record times will double with the release of Panasonic's 64GB P2 card in the fall. Other user-friendly recording modes include hot swapping for non-stop recording, loop record, pre-record, interval and one-shot recording. A time/date stamp function makes it ideal for use in law enforcement environments. The HPX170 is equipped with an HD/SD-SDI output standard for live feed productions as well as for editing and monitoring. It also has IEEE 1394 and USB 2.0 interfaces for fast P2 content transfer into NLE systems, and offers a composite output, component output (mini D-terminal) and a time-code setting via IEEE 1394. The camera also features a built-in stereo microphone and two-channel XLR audio input terminals supporting 48V phantom power supply with a selectable mic/line; and manual audio level volume (two-channel). Other convenient operational features include clip preview on the camera's 3.5" color LCD monitor; instant recording startup, scene files, assignable user buttons, focus assist and a camera remote function. The AG-HPX170 will be available in fall 2008. It will be covered by Panasonic's five-year limited P2 HD warranty*.